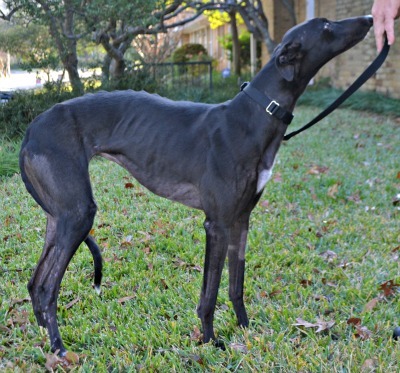 Dani, aka Springwater Dani, is a 3-year-old black female born January 18, 2013. Her sire is TK Quick Strike and her dam is Springwateranton. 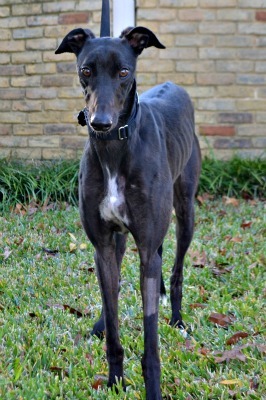 Dani has 70 races on record at Greyhound-data.com, all at Gulf Greyhound Park. She ended her career abruptly on October 1, 2015 with the fracture of her right rear leg. She is scheduled for surgery with Dr. Radasch at the Dallas Veterinary Surgical Center on Monday 10/5. Dani had surgery on Wednesday, October 7 performed by Dr. Bob Radasch of Dallas Veterinary Surgical Center. Her injury is complicated, as it is the central tarsal bone as well as the calcaneus of her right rear hock. Screws and wires were implanted into both areas, and an external fixator was designed to hold all in place for the next 8-10 weeks. She will be kept very quiet in her foster home during this time. Dani's surgery was performed by Dr. Bob Radasch of the Dallas Veterinary Surgical Center on October 7, 2015, placing the external fixator on her right rear leg. Her follow up x-ray is estimated for approximately December 16, 2015. She is being kept very quiet in her foster home during this time. X-rays were taken on December 16, which showed her leg to be healed. 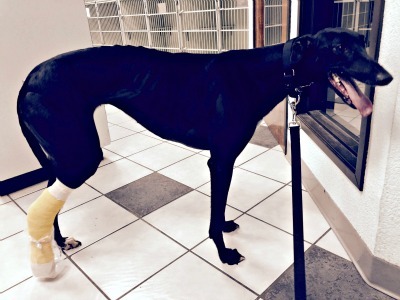 She is being leashed walked for several weeks, and as with most fractures with repairs, the screws may have to be removed if irritation occurs at a later date. Dani has now completed all her medical procedures and is ready to find her forever home!